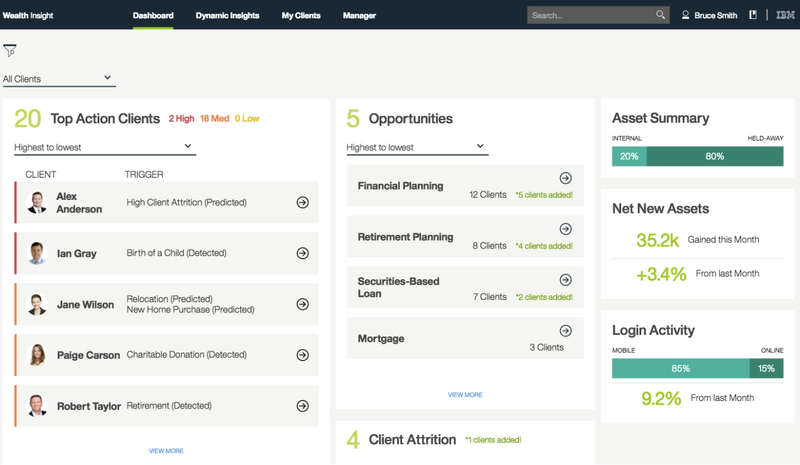 IBM Watson Client Insight for Wealth Management is an API-based, pre-built analytics solution for the wealth management industry that introduces financial advisors to a new era of advanced analytics and cognitive computing. It creates a comprehensive view of the client by delivering insights using multiple data sources inside the organization and helps financial advisors service their clients in a more personalized manner. It is now available on the Salesforce Financial Services Cloud where users have access to powerful insights from the IBM solution within the CRM dashboard, helping deliver personalized service to clients. Maximize productivity with pre-built dashboards, or by integrating powerful new insights into your favorite CRM system. Reinforce client loyalty with recommended retention strategies, and predict client attrition up to 30 days sooner. Provide high touch client engagement more efficiently via client-level behavioral profiles and prioritized lists of recommended actions. Generate incremental revenue with targeted product recommendations and a deeper understanding of individual client preferences.